A new team of talented players! Expect the unexpected: It's UNEXPECTED RUMBLE! The website is now https. OMG we just invented something else! Ego Trip: The members of a same team challenge a group composed by players of different teams (named: Meat Balls). If the Meat Balls win, they score a bonus of 1 victory point per team! See "Claims" and "Loyalty points and Victory points" and "Ego Trip"
The RIP are winning their first Ego Trip with a great score of 22.8 Pts in total! What a night. Match was streamed in french language for the first time. You can make a difference even if you are a team of 4 players. The league is a long way run competition ending June 15th - You can join anytime and fight the best team. A LOT OF GOOD NEWS! AND A CHAMPIONSHIP! Yes! Here comes the time! November will be the month of the Squad Championship! A massive Round Robin Tournament! 3 weeks of an intense tournament between the best Squad Teams. Starting November 12th - Saturday 8:00 UTC. Asteryks Division. is taking the lead followed by |HSR| and FFO. Well, More Matches, More players, More victories! You can join the League today. You only need 9 players in your teams. Announcing the two stage round robin November tournament 2016. We want and will have the league CLEAN. We are now informed that two members of Team Asteryks have been banned for cheating today. We are forced to act. 1. Each round played by the involved player will be removed from the overall calculation. 1. Mix with Team Asteryks included. Each round played with the involved player will be removed from the overall calculation. – Opponents have now round full victory points. Other Steam ID's are under investigation. Thanks to the devs and every persons fighting for honesty in video games. Discord has lost the validity of the invitation link. Give a new link? You might be a bit late on that buddy, seems it's ...just 'gone' from what I hear. Hi Guys, the competition is still on, more than ever. 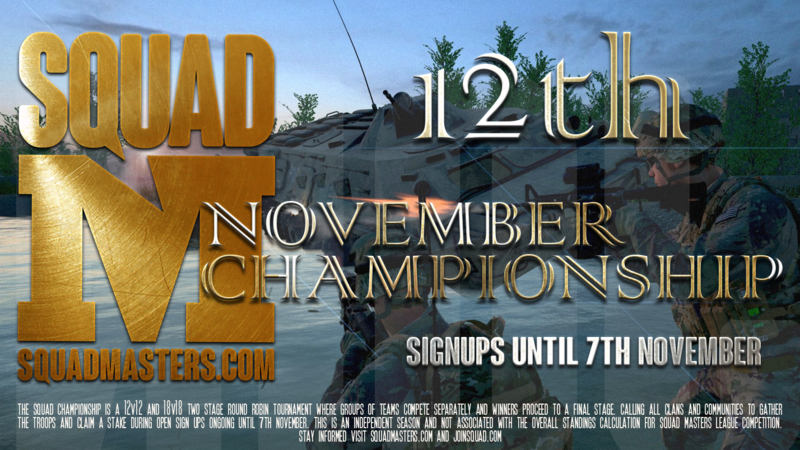 Don't forget to subscribe to the November Championship (read the news about it on Joinsquad official Devs Post). https://discord.gg/QdPsS2j Use that link to join us on Discord. SIGN UP FOR THE NOVEMBER TOURNAMENT!! Like I use to say, if you arent signing up for the November tournament, then what are you doing? FFO win the first LONG RUN SEASON! After around 60 played matches, some drama, 2 relaunchs, and a new world president - we are proud to announce that the first LONG RUN SEASON has a winner! FFO win the competition. What's next? Well, you should join the 12v12 Round Robin Tournament. It's fun - it's massive - it's highly competitive. We will announce the cast for the Squad Masters League 12v12 Round Robin Tournament tonight at 19h00 UTC. with a 184 Victory vs. Asteryks. Both teams are saved for the brackets! Teams Asteryks, [M], Raki and [whiteFOX] are saved. [1st] and [TAW] are forfeit.